Mike O’Boyle, director of electricity policy for Energy Innovation and a co-author of the report, attributes the "coal cost crossover" to the rapid decline in the cost of wind, solar and energy storage. 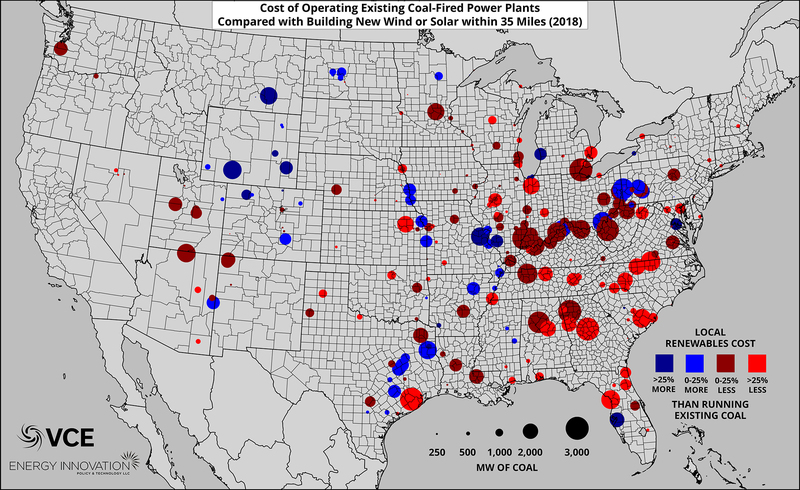 His team’s analysis found that combined fuel, maintenance and other costs of sustaining many existing coal-fired power plants is more expensive than the total, "all-in costs" of entirely new solar or wind projects within a 35 mile radius of the coal plant. "In fact, there may be opportunities to save money by transitioning away from coal and wholeheartedly embracing renewable energy," he said. In Wisconsin, the analysts found five coal-fired power plants, including Oak Creek and Edgewater, considered "at risk," meaning local wind or solar could replace the coal plant’s total output "at an all-in cost lower than the existing coal plant’s ongoing marginal cost." By 2025, they project that list to include the Columbia and John P. Madgett plants, amounting to a total of about 6 gigawatts of electricity. "In most cases it's not worth it. You're better off building a new solar or wind farm, and that's what utilities and developers, even in Wisconsin, are starting to do," Nemet said. "What we're trying to point out is where this condition exists, where wind and solar is significantly cheaper than coal, it sort of begs the question: Why are we keeping this coal plant around?" O’Boyle said. The authors identify several areas for further research, which relate to caveats in their own analysis. Their comparison was based on local projects, defined as installations within a 35 mile radius of an existing coal plant. O’Boyle argues this makes their findings "conservative," and that incorporating transmission — such as Wisconsin buying wind-generated energy from Minnesota — would better replicate the current energy grid and reduce costs further. Regardless, O’Boyle said their findings provide a strong starting point for discussing change. "Now is the right time to have that conversation and potentially move Wisconsin from a state that reflects the status quo for coal to a state that is leading and proactively embracing the transition that will also save customers money."